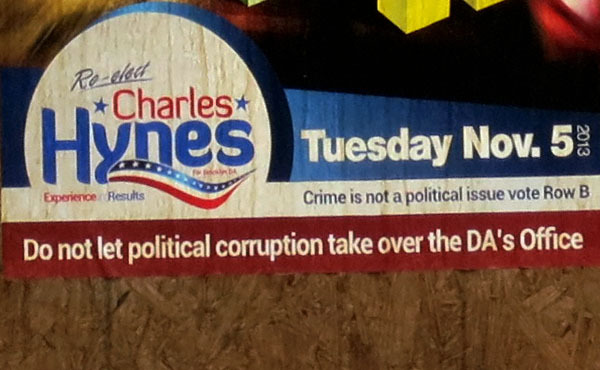 Excuse me if I am wrong here but I suspect the reason Mr. Hynes was defeated, by quite a commanding margin I’ll add, by Ken Thompson in the Democratic Primary was due to the fact folks hereabouts are tired of political corruption in the Brooklyn DA’s office. Then again, it has been established that Mr. Hynes does not seem to see it this way. That’s why he is running as a Republican. But I digress. And proceeded across the street to tear these damned things down. As I got closer I made an amusing discovery— one which made me reconsider my “plan of action”. It made me smile— and proud to be a Greenpointer! Well done, anonymous Greenpoint hooligan. WELL DONE!